Today’s competitive, high-risk/high-reward marketplace entices young entrepreneurs to develop (and cash in on) daring ideas virtually overnight. To remain relevant and enable emerging thinkers to pursue surer pathways to success, universities are introducing campus spaces where students can connect to fellow entrepreneurs and interested financiers. 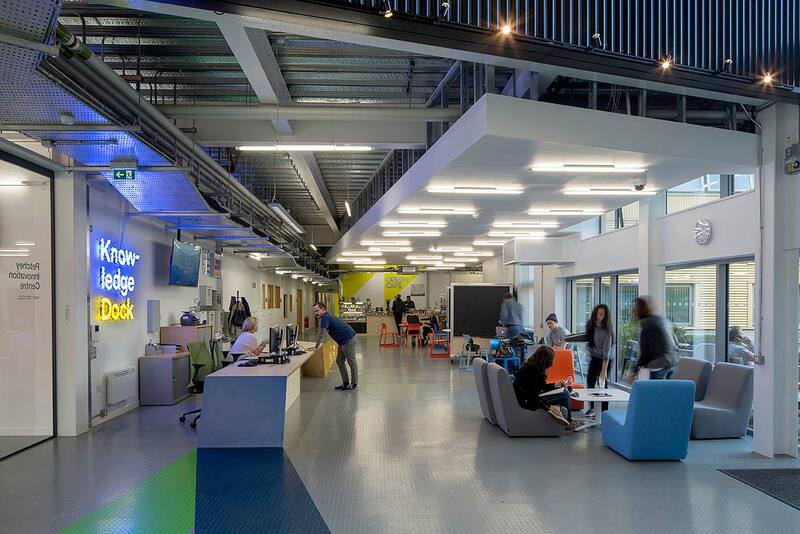 These new places – academic incubators – have helped universities rethink their place in preparing the next generation, creating entrepreneurial environments that facilitate connections and speed innovative ideas from concept to reality. What is an academic incubator? Functionally distinct from classrooms, libraries and student unions, academic incubators establish new forums for idea exchange on campus. Designed to spark strategic partnerships between academia and industry, incubators connect students to startups, investors and other collaborators they might not otherwise encounter. As such, academic incubators provide a community, resources and the physical environments essential to fostering entrepreneurial exploration. Depending on stated purpose and mission, incubators may offer: co-working or maker spaces, conference rooms, labs, cafes, concierge services and mentoring staff. Why are universities building them? Universities are assessing how best to prepare students for meaningful and rewarding careers. Today’s university students want more than academic degrees; they aim to launch businesses, develop new products and start social movements. In response, universities are building academic incubators to remain competitive and relevant; to attract and retain entrepreneurial students, faculty and researchers; and to forge connections between industry and academia. Incubators are now a vital part of the higher education landscape. They embrace a culture that promotes tenets like “take risks” and “fail fast,” while allowing students to develop hands-on entrepreneurial skills. Universities are keen to promote their startup spirit, because classroom settings often lack it. Incubators are distinct academic ecosystems populated by curious and inquisitive entrepreneurs, free agents, programmers, designers, dreamers, angel investors, tinkerers, venture capitalists and more. Students seeking connections to the marketplace use incubators, as do companies looking to recruit top talent, and research organizations seeking people who think in entrepreneurial ways. What benefits do incubators offer? Academic incubators position universities as progressive places, attracting students to learning environments very different from conventional classroom settings. Simultaneously, businesses look to incubators to surface an academic institution’s intellectual capital and top talent. Incubators also enable companies to participate in cutting-edge research without having to invest significant resources. For cities, incubators offer a vision of what a city could be, or what a city aspires to be. They raise awareness of a city’s ambitions, attracting established corporations and their workforces, while sparking startups to support neighborhood growth and development. 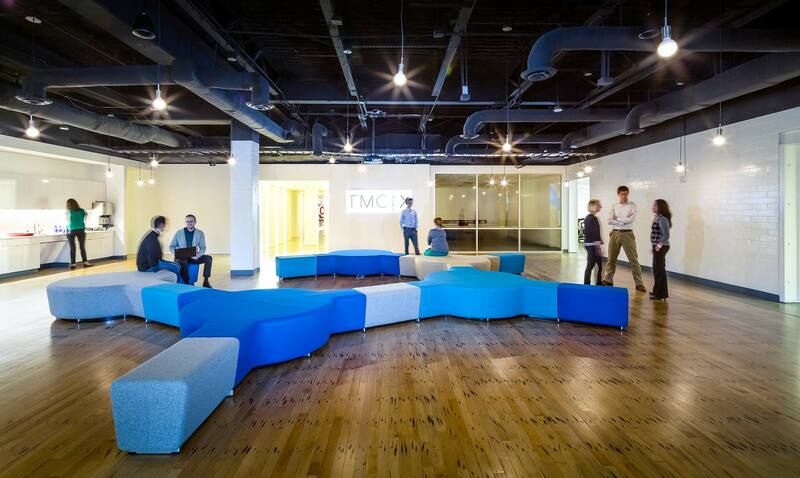 How does design impact the success of an incubator? Design plays a key role in shaping an incubator’s vision and direction, and sets the tone for what happens inside the space. While incubator design shares a common theme of flexibility, it does more: the design offers cues to people using the space, inspiring them to connect in new ways. Unlike traditional academic design, incubators are more likely to resemble co-working spaces and startup offices, offering people choice and control over where and how they work. Incubators provide students a glimpse of where they could go after they make the leap from campus to workplace. In the coming months, Gensler’s global education design practice will share academic incubator stories from projects it’s designed in cities including London, New York, Chicago, Houston, Cambridge, Baltimore, São Paulo and Suzhou. We’ll explain the myriad benefits incubators offer students, universities, industry and cities alike, as we articulate why good design can differentiate successful incubators from those that fall short.